HVAC ‹ Regent Heating and Air, Inc. Installation right in your neighborhood! If you have heating or cooling problems you should give us a call. Regent Heating & Air Conditioning, Inc. Based in Port Chester, New York, we offer HVAC repair, sales, and installation. 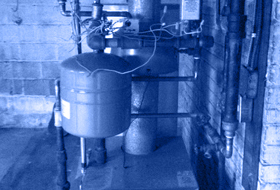 We service all major types of heating and air conditioning equipment, including water heaters and humidifiers. Custom duct fabrication is also available. Make sure your home stays comfortable with our repair and maintenance services. We repair air conditioners, heating and cooling units, and furnaces for your home or place of business. Have our technicians install new heating and air conditioning units in your commercial or residential settings. Our technicians provide service and installation for you with high-efficiency air conditioning and heating units as well as gas hot water boilers. Find the right HVAC unit for your home or business through our equipment sales. We sell all major brands of heating and air conditioning equipment along with any needed parts. Keep your home at the right temperature when we install digital, programmable Honeywell™ and White Rodger™ thermostats. These include “smart thermostats” that let you monitor your home temperature from any computer or mobile device when your working or away. We also are a Nest Pro installer. Service and installation are available for Aprilaire™ and Honeywell™ humidifiers. We also offer humidifier parts along with media and filter pads stocked in our service trucks. Contact Us to schedule a free estimate or service inspection of your equipment today! We are a participating contractor for CON ED™ energy-efficiency program – installing high efficient equipment. Click Here for rebate applications. © 2016 Regent Heating & Air Conditioning Inc. All rights reserved.